(Nanowerk News) Physicists of Jena University (Germany) simulate for the first time charged Majorana particles – elementary particles, which are not supposed to exist. 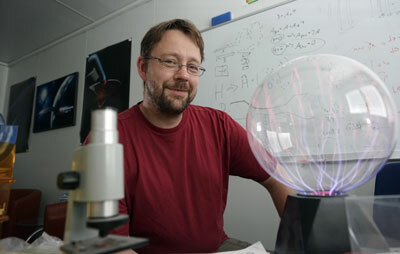 In the new edition of the science magazine Optica ("Optical simulation of charge conservation violation and Majorana dynamics") they explain their approach: Professor Dr. Alexander Szameit and his team developed a photonic set-up that consists of complex waveguide circuits engraved in a glass chip, which enables them to simulate charged Majorana particles and, thus, allows to conduct physical experiments. Alexander Szameit and his team of the University Jena developed a photonic set-up that can simulate non-physical processes in a laboratory. March 1938: The Italian elementary particle physicist Ettore Majorana boarded a post ship in Naples, heading for Palermo. But he either never arrives there - or he leaves the city straight away – ever since that day there has been no trace of the exceptional scientist and until today his mysterious disappearance remains unresolved. Since then, Majorana, a pupil of the Nobel Prize winner Enrico Fermi, has more or less been forgotten. What the scientific world does remember though is a theory about nuclear forces, which he developed, and a very particular elementary particle. “At the same time we send two rays of light through parallel running waveguide lattices, which show the opposing characteristics separately,“ explains Dr. Robert Keil, the first author of the study. After evolution through the lattices, the two waves interfere and form an optical Majoranon, which can be measured as a light distribution. Thus, the scientists create an image that catches this effect like a photograph – in this case the state of a Majoranon at a defined moment in time. With the help of this system, one can conduct experiments in which conservation of charge – one of the pillars of modern physics – can easily be suspended.